Calorie Cash™ is a free calorie counter to lose weight. 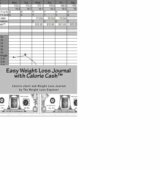 Depending on how you look at it, what I offer here is either a free calorie counter chart to lose weight and a free calorie counter program to lose weight or a free calorie counter book to lose weight. My book which is for your personal use only emphasizes a calorie chart because it is important to read over the chart before deciding what to eat. If you rely totally on a calorie app you are not planning, and planning is an important part of any diet. I am offering my book which currently sells for $6.99 at Amazon free because I am hoping that a few of you will later want the “Easy Weight Loss Journal with Calorie Cash™. This page makes using the book easy. To lose weight just, follow these easy steps. 1. Use the “Calorie Counter to lose weight” calculator to find out how many calories a day you should be eating. These numbers are just estimates based on averages. Everyone is different. You will need to keep up with your weight in the journal to fine tune how many calories are right for you. 2. The first part of the book tells you how to look long range and plan your weight loss. It talks about planning diet vacations and how to plan for problems that might arise. 3. The book contains a Calorie Chart that shows how many calories there are in various foods of a specific portion size. Look at the chart before deciding what to eat. Try to get in a routine. 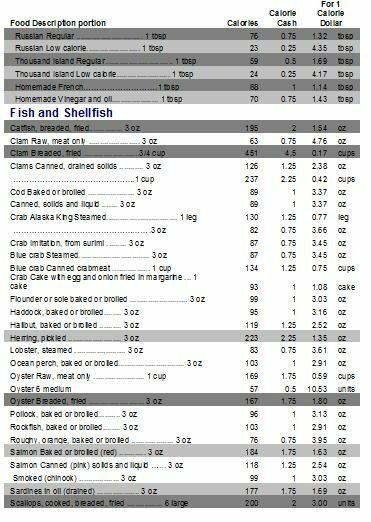 Here is a sample of the type of calorie chart you will find in the book. The darker the shading, the more you should try and avoid those foods. Also notice the Calorie Cash™ column to see how it is nothing more than calories rounded to the nearest 25. This calculator is a starting point for deciding how many calories are needed to lose weight. To lose a pound a week, see the third results in the table above. To lose two pounds a week see the forth results. The fifth and sixth results go hand in hand. Six days a week eat the amount in the fifth results in the chart above. One day a week, reset your metabolism by eating what is in the very last results. (One day only) Remember to tell friends about the free book on this page and to bookmark this page, because as you lose weight you will need to eat less to continue to lose weight. Also remember to weigh yourself on a regular basis and to record this weight. When you begin to cheat, you will see the weight not being lost. 1. Where does this chart come from? It comes from average results from data such as that in the table below. It is not an exact science so make sure you keep a journal. 2. Do not count your exercise calories twice. In this calculator you estimate your calories.